They are a mainstay of almost every hamper pulled out at elevenses. Perfect finger food, along with a cup of bullshot they’ll keep feeling satisfied even on the coldest day. But what makes a good sausage roll? The tracksuit brigade in towns across the country are happy with a Greggs sausage roll; but we should be looking to push the boat out on a shoot day and really make these something special. They should be moist and meaty. To my mind they should also have a nice sweetness which balances the savouriness of good pork. Good quality sausage-meat is a must. If you have a local butcher with access to Gloucester Old Spot you are onto a winner. Other county breeds may suffice, but I’m lucky enough to be based near the birthplace of the best meat pig in the world. Of course, there’s no reason why you couldn’t swap out the pork for some wild boar… One shoot we work with shoots three or four of these menaces a week! This would be a perfect way to use up some of that delicious meat. Chop the smoked bacon into small pieces and begin frying in a pan along with the red onions, sliced. Once the onions have begun to soften add the vinegar and sugar and stir together. At this stage add a small glass of sloe gin (a shot or two equivalent). Reduce the heat and cook slowly for 5-10 mins to allow the onions to soften more and the vinegar/sugar to reduce into a sticky glaze. Set aside to cool. Blitz up some breadcrumbs (approximately a small mug’s worth). Some old baguette or stale crusty bread is ideal. The breadcrumbs will soak up the fat from the sausagemeat as the rolls cook. This has two amazing benefits – less mess to clean up, and you end up with a super succulent and moist meaty middle rather than soggy pastry. Mix the breadcrumbs and cooled onion mixture into the sausagemeat. I heartily recommend using your hands – it’s much quicker. Also throw in a teaspoon or two of sage and oregano and a couple of grates of nutmeg. Season well with salt and pepper. Now you have your filling. You want a strip of pastry about 20cm deep to make your sausage rolls. A pre-rolled sheet sliced down the middle length-ways should be just about right. Pre-rolled is perfectly acceptable – even proper chefs recommend it unless you have your own pastry chef. Brush some milk or a beaten egg (or water at a push) along the front edge of your pastry, then pull the back half over the meat and join along the front. Press together to ensure it sticks – I often use a fork for this, which also gives the benefit of a nice pattern. 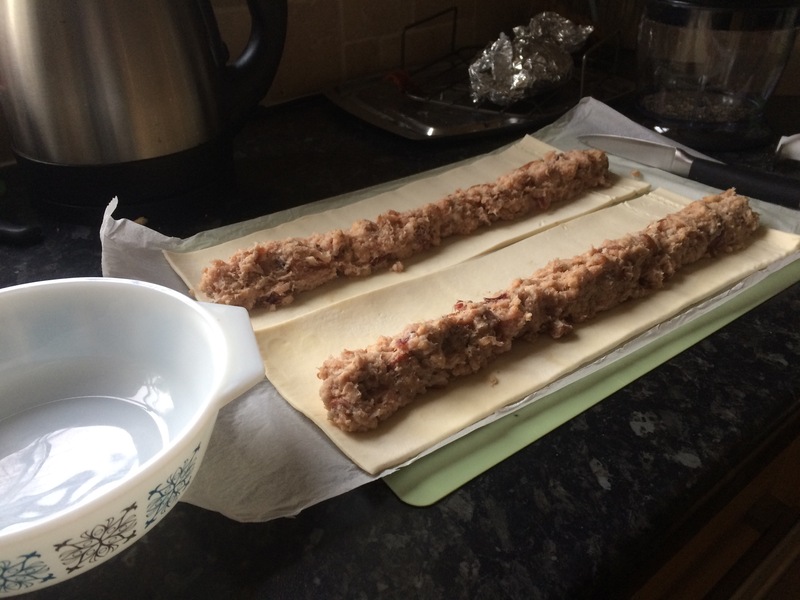 Chop your long sausage rolls into individual portions. If you have milk or egg, brush some on the top of the rolls to help them attain a lovely golden colour whilst cooking. 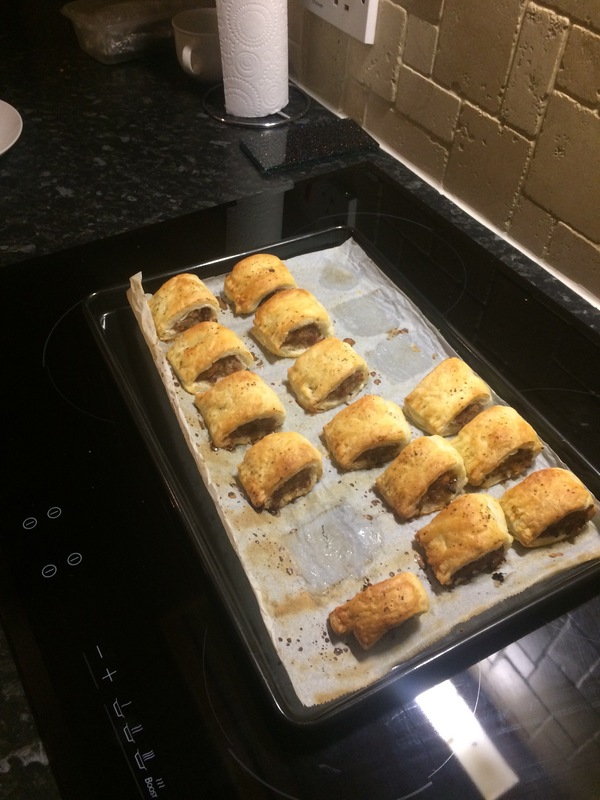 Whack the sausage rolls on a baking tray (on baking paper, if you’re sensible) and bake for 20-25 minutes at 200ºC (fan). Any excess sausage-meat can be baked at the same time in an oven-proof dish. NB. If you want to keep things simple, you can use pre-made caramelised onion sausages instead of making the mix yourself. Simply squeeze the meat out of the skins, add some breadcrumbs and a splash of balsamic vinegar. I use this cheat occasionally and the result is almost as delicious. 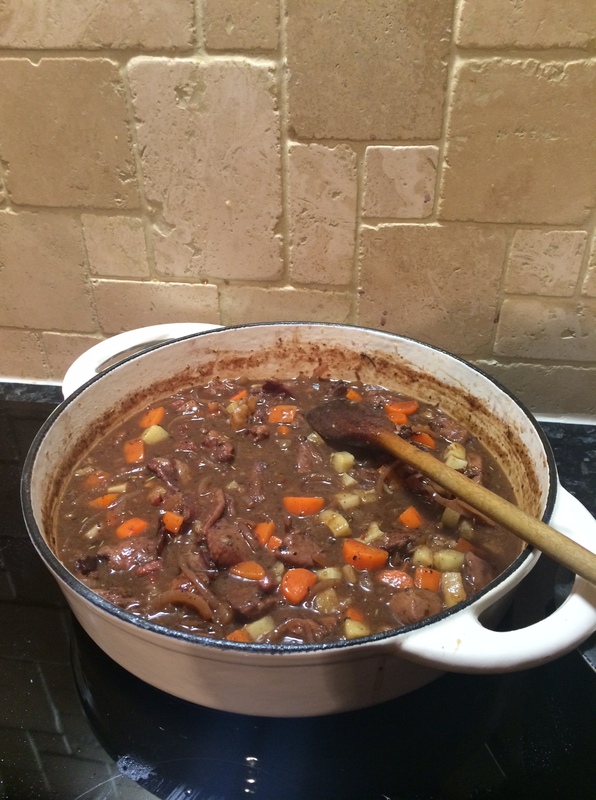 TOP TIP… If you have some to hand I would highly recommend adding a minced pigeon breast. This adds a nice richness and depth of flavour. Plus, let’s be honest, it’s always nice to add something from around the shoot to the mix. We’ve got some super exciting announcements in the pipeline at the moment, and some interesting blog posts in the drafts folder. However, that’s all still to come, for today, here’s a recipe that’s worth considering for the weekend – with no Six Nations it gives an opportunity to enjoy some time in the kitchen. 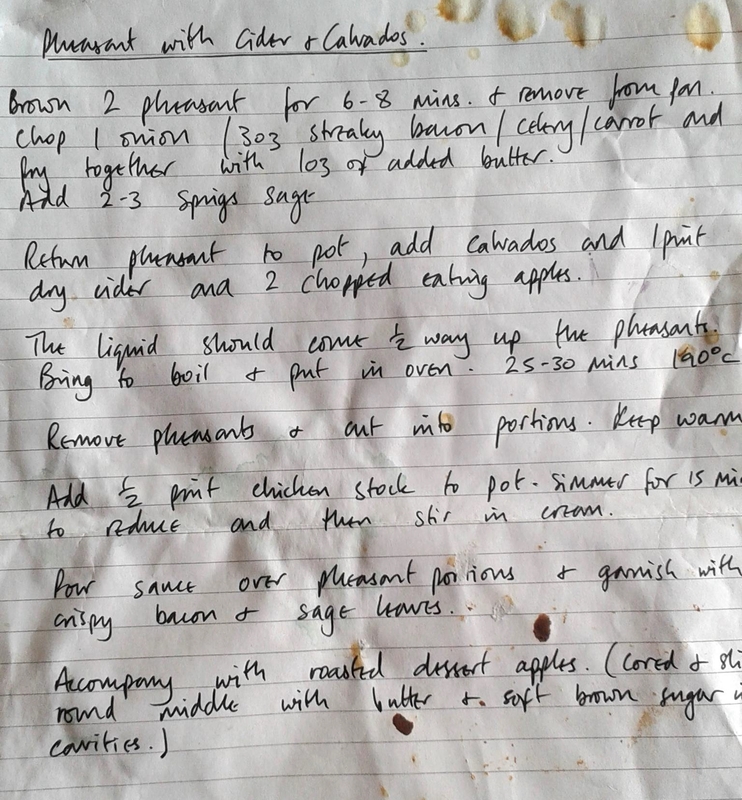 This is a recipe which has kindly been sent to us by one of the guns from our roving syndicate! If you have any pheasant in the freezer from last season then give this a go! It’s warming, but a little lighter than mid-winter fare, perfect as we enter the spring! If you don’t have any left, don’t worry, it’s perfect in the early season when apples are ripe and ready for the picking! Brown two pheasants and remove from pan. Chop an onion, streaky bacon, a carrot, and celery and fry off with butter in the pan you browned the pheasants in. Add a couple of leaves of sage. Return the pheasant to the pan, add the calvados, a pint of off-dry cider, and two chopped eating apples. Bring to the boil, then put in the oven for 25-30 minutes for 190°C. After taking out of the oven, remove pheasants, chop into portions and keep warm. Add half a pint of stock (as described below) to the liquid left in the pan, simmer for 15 minutes to reduce, and then stir in the cream. Pour the sauce over the pheasants and garnish with crispy bacon and sage leaves. Serve with baked dessert apples (core, half, and sprinkle with brown sugar). Roast carcasses in a hot oven for about 20 minutes with onion, celery, carrot, peppercorns and bay-leaf. 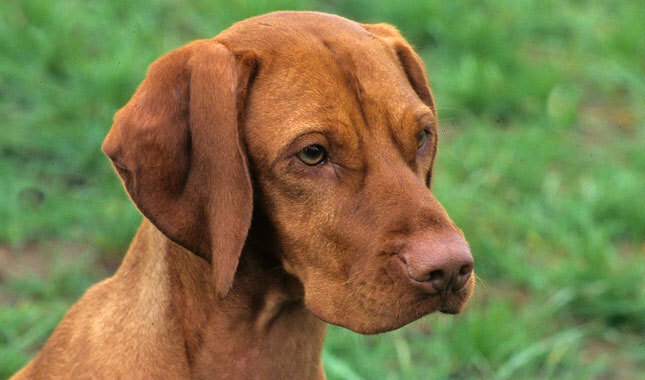 (Not required with bones from a roast). Simmer the carcasses (along with any small bones, juices, or roasted veg bits from the previous step) in a covered pan of water. 500ml should be about right for the recipe above. Long and slow is the aim of the game here – several hours at a low temperature is best! 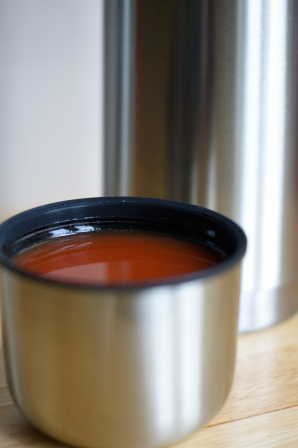 Once the stock has a nice colour to it, and the taste has become gorgeously rich with pheasant flavours, it’s good to go! Strain into a bowl and refrigerate, allowing the flavours to develop and harmonise even further! 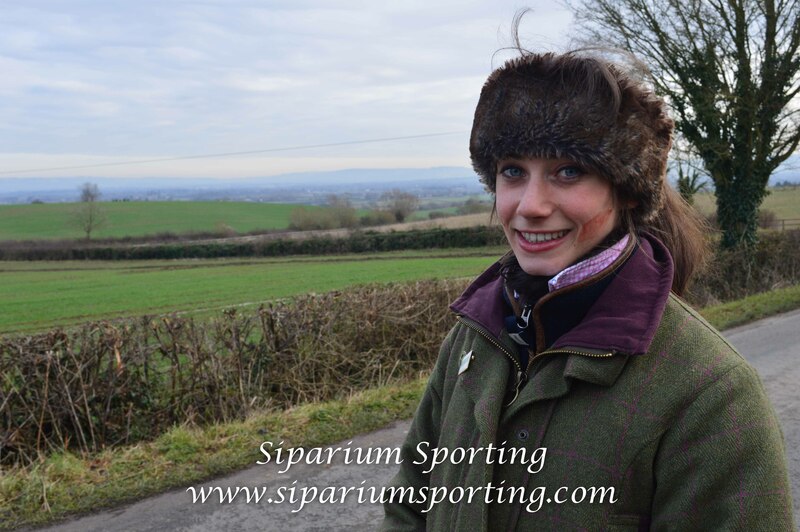 This week saw our last Roving Syndicate shoot-day of the season. 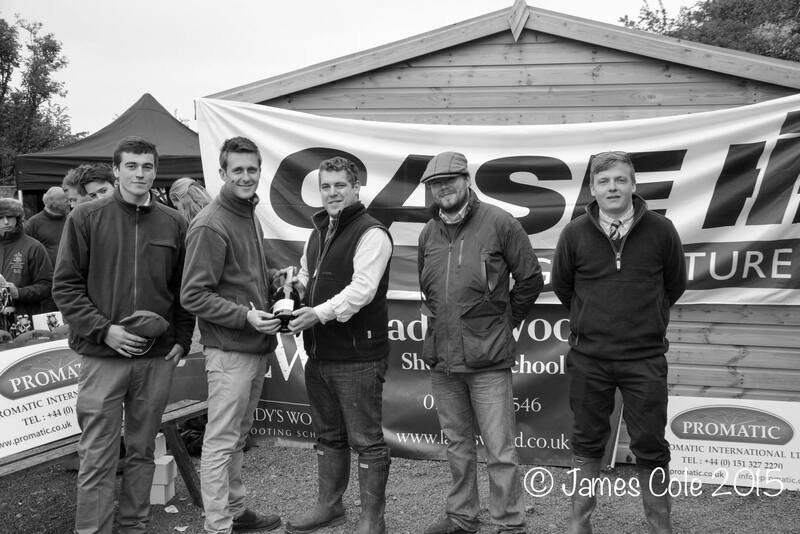 A team of enthusiastic guns and loaders met up for a filling breakfast on Tuesday morning at Hartpury College, just outside of Gloucester. A large crowd turned out – with some guns sharing pegs or bringing loaders or pickers-up – which made for a particularly sociable day to round off our season. The team brought together a good range of shooters. On the one hand we had Ellie Kay, the Royal Agricultural College’s Shooting Club Chairman – an excellent clay basher, but a first-time game shot. On the other hand, we also welcomed Andrew Davies, the Secretary of the Standing Conference on Countryside Sports. 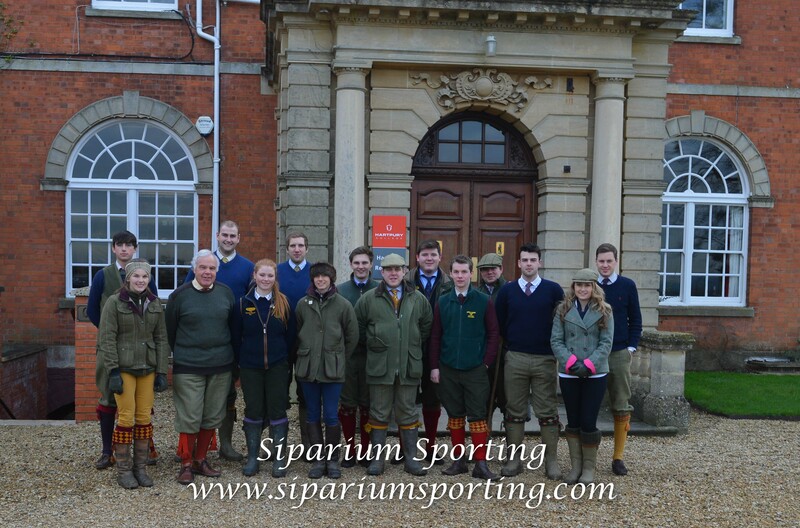 We were also delighted to be joined by Chris Horne from Guns on Pegs alongside a number of other keen shots anticipating a sociable day of sport. Following our substantial cooked breakfast, during which I discussed our exciting plans for a gamekeeping apprenticeship with Chris, the team filtered through to the car-park to jump into the gun-bus and pick-ups which would ferry us around the shooting area. First up was a short journey towards Maisemore for a pair of partridge drives. The first of these was a little disappointing – plenty of birds streamed passed the guns, but very few were high enough to make for safe and sporting shooting. Despite the beaters’ best efforts, they could not be lifted! 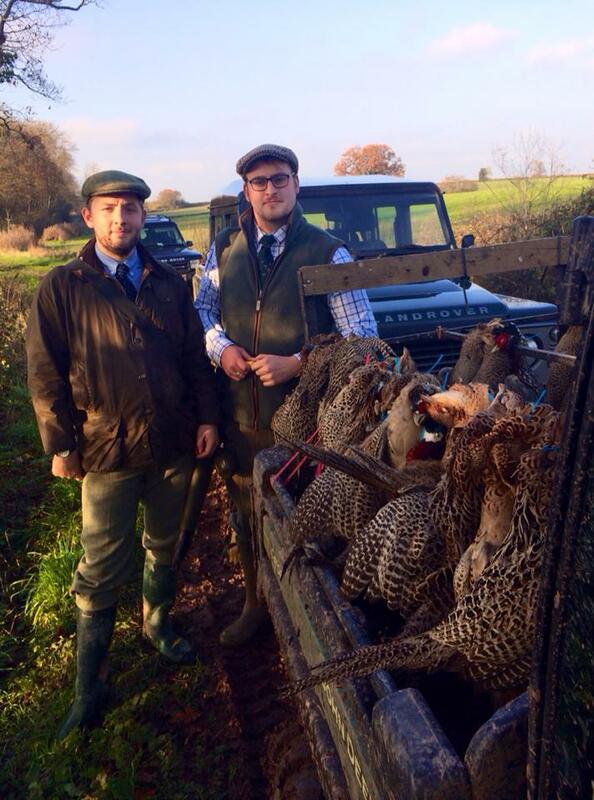 The second drive was more successful, with the majority of the day’s 25 partridge coming from that 20 minute spell. The birds seemed a bit happier to get airborne, and the guns stood just down a slight slope to the left-hand end of the line got some much more sporting birds. A leisurely drinks break was enjoyed by all, as a glass of sloe gin accompanied excited talk of the next drive – which would see pheasants pushed across a steep, wooded valley. Gaps in the trees gave an opportunity for the guns to enjoy some snap shooting, adding some nice variety to the day. A jay was particularly unlucky to happen across a team of guns who were in a clinical mood, adding a little fun to proceedings as a couple of guns debated who had brought it down… Ellie Kay, the RAC’s Shooting Club Chairman, was finally blooded at the end of the drive, having had some torrid luck on the first two, having not fired a shot… A healthy return of four pheasants more than made up for it. Following the blooding, the team made their way back through the wood and across a field to the waiting transport and we made our way back to the Main House at Hartpury College where lunch was taken. A selection of sandwiches and a delicious and hearty soup warmed everyone on a cold day as conversation turned to the afternoon’s pheasant drives. The first drive after lunch provided a few thick flurries of pheasants from a large area of cover crop. Adding some interest to proceedings, a few sheep were merrily leaping through the line at times. The last two drives soon followed as we tried to get as much shooting in before the darkness descended. The first of these saw a good few bigger birds pulled down before the team moved onto the final drive. The whole team lined up along a ride in a small wood – the student beaters then moved through to flush all the birds which had been blanked in before the guns arrived. A series of prolonged flushes of tree-top high birds provided plenty of excellent sport to round off an enjoyable day and bring the bag up to 90 on the day. All the guns retired to the Main House once more for a tasty four course meal and an analysis of the day’s proceedings. Having all shot fantastically there was little for any of the guns to be disheartened about as they recounted their shooting. A bit of a breeze on the first drive, just to lift the surface skimming partridge we encountered would probably have seen the bag surpass the 100 bird mark, but that was the only thing we were wanting for all day. For a full gallery of photos from the day, please click here. If you’re interested in booking a peg on one of our roving syndicate days next season, then take a look at our website (click here) and get in touch.